PDR Knockdown / Tapper – A small device used to tap high spots. When performing paintless dent repair, the dents do not just “pop” out. They are slowly and methodically rubbed out using hundreds of tiny pushes in attempt to reshape the metal to pre-dented condition. Sometimes these pushes are pushed past the point they should be. Sometimes accidentally and sometimes on purpose. When these high spots are created, the technician performing the repair will reach for his “knockdown” tool. He will place the tool directly on the high spot and tap it back down by striking the PDR knockdown tool with either a hammer, wedge, paddle or other object. Some dents have such severe impacts that the technician will actually use his/her PDR knockdown to soften the dent before even beginning to push the metal. 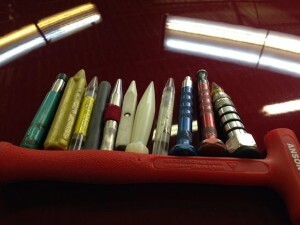 The photo below shows the SideWinder from Atlas, several DentCraft tappers and Ultra soft tip knockdown and many others. A PDR Knockdown is often overlooked, yet a crucial tool used during dent repair. When people order their very first dent tools, they often overlook getting a knockdown. Without one, the novice technician does not stand a chance. These little tools are used for relieving pressure, correcting over-pushes and many other steps of paintless dent repair. The knockdown is one tool that most techs carry several different styles as well as back-ups of their favorite in case it gets misplaced or damaged. 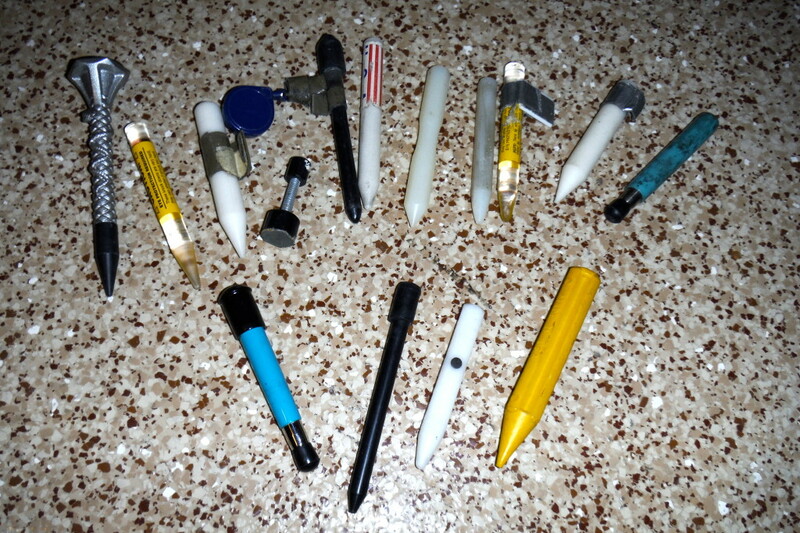 The photo above shows the SideWinder from Atlas, several DentCraft tappers and Ultra soft tip knockdown and many others. Click here to view dent repair tool vendors. Read about the next term: Laminated Window / Laminated Glass / Double Paneled Glass – Windows that have two thin panes of glass instead of one thick one.